The following information was taken from Wikipedia. Starston is a small village in Norfolk. It covers an area of 9.02 km2 (3.48 sq mi) and had a population of 321 in 123 households at the 2001 census, the population increasing to 331 at the 2011 Census. 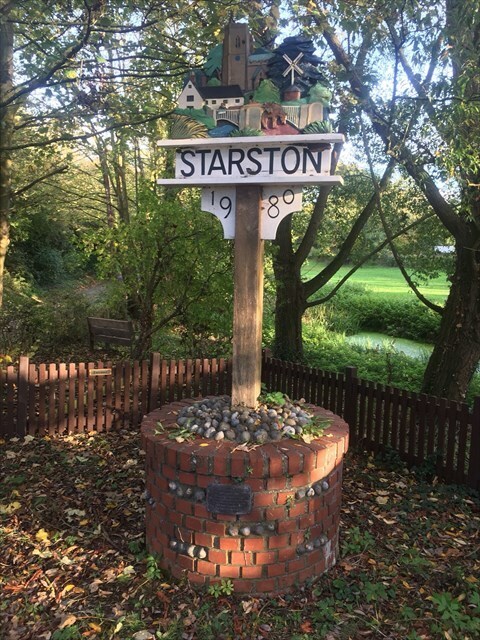 The Starston sign features a wind pump that was used to transport water from the Beck river up to Starston Place, which was demolished during the early 1900s. The wind pump can still be seen from the roadside. Between 1856 and 1866, it had its own railway station on the Waveney Valley Line before it was shut to passenger trains through lack of usage. Freight and passenger through trains continued until the Beeching axe fell in the 1960s. The village had a pub called "The Gate" until the 1950s. This was turned into a shop, which closed in 1984. The pub sign still exists and is owned by local residents. The village school closed in 1968. Most village children now attend schools in the town of Harleston, about 1 mile (1.6 km) away. In 2010, Starston villagers purchased Glebe Meadow in the heart of the village and converted it into a public space with attractive views of the church. I would recommend parking on Church Hill on the side of road next to the Church and most definitely walking to the final location as the road is narrow and fairly busy most of the time. There is also no parking at the final. After you have you're final co-ordinates head along Low Road and all will become clear. This cache is a simple two part multi due to the close proximity of the Church Micro and wind pump caches. At the posted co-ordinates, opposite the sign you should find some gates. Remade in loving memory of James Newby ABCD-EFGH.